Thanks for bringing this project to our attention; I’ve forwarded it to a few photographer friends. I couldn’t attempt a makeover without a creative brief, which requires direct interface with the client — do they want a logo, and why, and what, and etc., etc. But here’s a 30-second crit. The logo is serviceable as a label but visually out of touch. The dense block of bold, cap, slab-serif type on the massive black rectangle is too heavy-handed for the gentle-spirited nature of the project (“families during their most fragile time”), although I see that the rectangle is not used on their site. Its complexity, too, makes it difficult to remember,* opposite what you need in a logo. The camera lens looks like a giant, all-seeing eyeball staring RIGHT AT ME, radiating power. It makes me want to look away. The awareness ribbon doesn’t add much, and it’s too generic for use in a logo. You want a logo to be ownable. On the upside, it’s well crafted, and the typestyles, shapes and colors all coordinate well. My sense is that this project requires something small, light, and low-key, probably in black & white or shades of gray, which is soft, like their site (and mission), and evokes photography. The point is not GRAPHIC DESIGN (in caps on purpose) but the photographers’ gifts to those losing someone to cancer. But without speaking to the client, I couldn’t know. Thanks again. Keep us posted. *Is your image simple? Apply the three-second test. Look at the image for three seconds and look away. What do you remember? Try it on a friend. Or have a friend try it on you. For some reason I keep thinking of the flash of a photo being taken — like the flash of someone’s life, the light that life is. That serving as a background to the acronym. And yes, I agree, the font is rather heavy for the subject. This is a situation where seeing the “product” might speak more than any logo would. A professional portrait of a cancer patient with their family, if rightly done, would be very touching and memorable. No logo or words necessary. I agree that it’s too heavy. I don’t think the camera lens conveys what the company is all about. 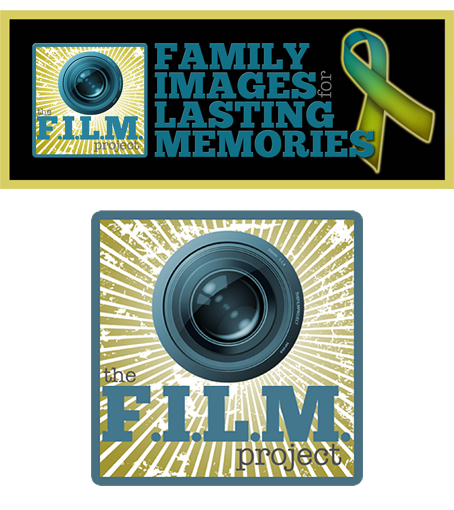 This logo could be for any company that does photography or film work and has nothing to do with “gifting family portraits to cancer patients,” which should be the focus (no pun intended). This isn’t an easy thing to communicate in a logo, but sometimes you have to dig a lot deeper to find a solution that really works. John sums it up pretty well. I might also offer possibly using a visual that includes analog film (sprocket holes and all) that reinforces the acronym in the name. Each frame might contain an image along the lines of what Tom Semme suggests. I agree with John. Furthermore, being a two-time cancer patient myself, this is one of those situations where the presence of the group should “disappear” into the background. Something subtle, unobtrusive. I actually think a wordmark might be one way to go. Images are difficult here: they tend toward the sappy or the precious, and though there is plenty of room for humor in such a situation, it is often overlooked or deemed inappropriate. I’d try a wordmark in a gentle typeface, light color, perhaps all lowercase, if that’s not too precious. Perhaps even Cezanne P-22 or Ex Ponto or Caflisch. A flowing script that insinuates its way into the conversation rather than stomping in on slab-serif feet. And of course, to reiterate John, without the client’s brief it’s next to impossible. John’s positive observations stand as well. The caveat is to serve the client, but also the client’s target audience. Best of luck! I love their website and think the logo is really out of place in the website . . . it is old-fashioned, and I don’t like the relationship between the rounded rectangle, the camera lens and the grunge, ray-like background. When I looked at all the pictures in the website, the common element that stayed with me is the “smile” on everyone’s face . . . so why not incorporate a smile in the logo? A very simplistic outline of a camera and, instead of a lens, a smile . . . something like that . . . very simple, few lines, and stay with the monochromatic colors from the website . . . they look great! For me, black symbolizes death, so it’s a no-go; and I would have a warmer color, ochre, sandy reddish perhaps, softer colors in the background to give some warmth. I guess two hands have become too much of a cliché to use; a family photo might get too busy and lose the clean, crisp effect you seem to be after. For me, even real grey is too funeral-parlor. A light, subdued yellow background or very light rust would soften the starkness of the lens. Some of my thoughts. I never guessed it was a logo for such a delicate subject, although for other purposes it could work. Thanks. Playing off of Steve Nagy’s concept; perhaps the commemorative ribbon should be made of analog film. In subtle grays or more subdued colors, with a softer, more personable font. Perhaps add a camera silhouette (even with a flash as Amy suggested) to reiterate the photography aspect (the loop of film by itself might evoke a mental image of motion picture film instead). Right off, I don’t like the FILM theme. It doesn’t reflect the sensitivity of family portraits. The word FILM makes me think of the film industry, and so does the image of the lens. And the colors are gloomy, like something that would be used in a scary movie. When I read the description and purpose of the Family Images for Lasting Memories, it touches one much deeper than what is displayed in the logo. First, note that the ribbon has become very recognizable as a cancer support icon and can be very useful. Second, I see on the web site a warm friendly scripty font. So why not use a calligraphy font, much like “Ribbons.” Next, use a heartwarming color: I think the intent for this company is to gift those who are suffering to help relieve their pain and/or loss, so perhaps something like sunlight might be suitable for a color (this is similar to the flash idea mentioned above). And lastly, I don’t think the logo should be enclosed in a box type shape; it’s too confining and restrictive for the emotions involved in this situation (like a coffin). It should be open and freeing, like a spirit, or hope, or a continuation of memories; maybe a loop or spiral if any shape or container is needed. I agree. F.I.L.M. reminds me of so many things other than the message they’re trying to convey. In most of the beautiful photos on the website, I see courage, hope, tenacity, and happiness in the face of adversity. Something open, airy and free-spirited gets my vote. They are beautiful photographs. Love it. My initial reaction to the design is that it’s over-complicated. Too much is competing for my attention, and as a result it did not arouse any specific emotions within me that relate to the overall goal of the project. Also, the color combinations seem a bit out of synch for me. A simpler — and more tender — feel is worth exploring. When I show off a good photo I’ve taken, I sometimes hear from people that I must have a good camera. Well, yes and no. Mostly no. The results come from inside me and from the subject itself. The camera doesn’t matter much. As they say in the old country, the music is not in the violin. Not to beat this to death, but if we were promoting a restaurant, would a picture of the stove be your first choice? About awareness ribbons and bracelets, my impression is their day is done. If you use one now, it places you squarely on an old broken-down bandwagon — the kind people go around the block to avoid. Good luck with your project. A friend of mine just lost his 25-year-old son in a tragic accident, and his photo memorial on Facebook made us cry. To my knowledge, no one has ever wept over a camera lens. Skip, you have some good points. I love the analogy of the restaurant and stove; it states your point perfectly. What one wants to see is the benefit they’ll get from the product, not the tool they use. But that’s more about advertising or marketing. A logo should give you a picture or sense of the company’s mission or personality. And perhaps to some, the ribbon is used up. I’ve become a little calloused to the “pink” ribbon myself. But the reality of the ribbon is that it demonstrates the multitude of how many people are truly affected by cancer. Maybe the pink ribbon is becoming old, or maybe it’s just become very familiar. Familiar is good; that’s what you want a logo to have — instant recognition. Instant recognition, yes. But not instant generic recognition. A logo must be ownable; that is, it must be specific to you, which the ribbon cannot be. John, not to argue with you, you have a good point, but I always like a good discussion and like to look at all angles. I often find design rules are subjective, and the new, upcoming designers are the ones who break the rules successfully. I find generic recognition is used all the time in logo design — successfully. Consider the following logos: Apple, Inc., Bell telephone, Quaker Oats, Target, Taco Bell, Firefox, and Spider-Man. They all start with a generic, recognizable image and transform it into their own unique logo. I don’t think that any of these iconic images are specific only to the company. For example, I’ve seen the bell used in colleges, bank, and insurance logos. Yes, those might be boring (perhaps serves your point). But consider the apple . . . used first by The Beatles and Apple Records. Of course, the exact ribbon icon presently used for cancer would not be acceptable, but using the elements of the ribbon transformed with a film strip, for example, would work because it exemplifies the heart and purpose of the film company. A logo “Should be able to project a company’s image, strength and integrity” (found on LogoBlog). Time to “pull at the heart strings” I think . . . and another cliché: “think different”. . .
I’m thinking you shouldn’t take the camera and photography thing so literally and maybe think a little more abstract. Some people are suggesting big-budget photos, etc. But what I think you could do that may involve some trial and error is to get some actual family photos . . . maybe use a posterize effect, and use some warm colors like brown, orange, gold, yellow, purple/mauve . . . I’m kinda thinking along the lines of the famous Obama print. As for fonts, I’d try to stick with something classy and readable . . . maybe a serif or italic font . . . but keep it bold . . . no scripts; if it’s a logo, you want it readable. If you had a posterized family photo (maybe you could find a stock photo), using the aformentioned colors, you could color one individual in the family slightly different. I think that would definitely convey the meaning of the service. And it would be very simple and dramatic.